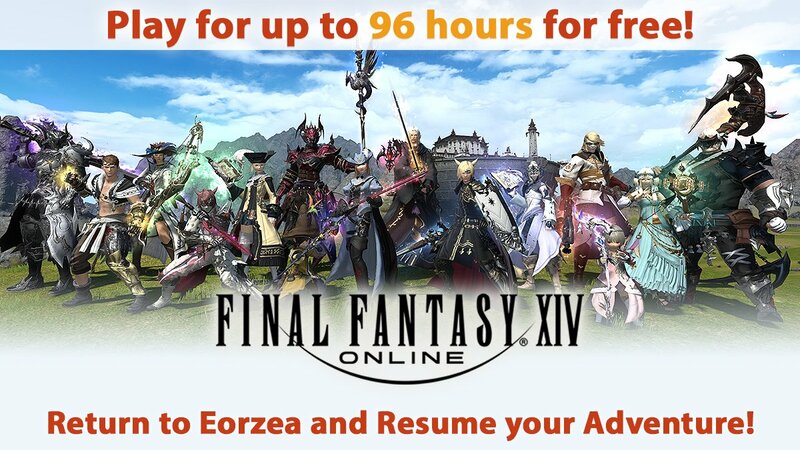 Square Enix lets former and future Final Fantasy XIV players play the latest content of the MMORPG for free for 96 hours. FOR WHOM IS THE ACTION AND WHO IS PARTICIPATED? Player with a SE service account for the retail version of FFXIV. Players who do not have a service account with an active subscription (service account whose paid subscription has not yet expired). More than 30 days have elapsed since the subscription or free play time, if there was no subscription. From Tuesday, 27.03.2018 at 13:00 (CEST) to Sunday, 06.05.2018 at 16:59 (CEST). From logging on, you can play the game for 4 days for free (until 23:59 (local time) on the third day). The client can be downloaded here. After launching the game client, enter your Square Enix ID and password on the launcher and registration page to log in. The free game starts with the login. The free play time lasts until the third day at 23:59 (local time) after logging in. If you are on 28.03. logged in at 0:00 (local time), you can 96 hours long, that is until 31.03. play for free at 23:59. The free play time ends on the third day after logging in at 23:59, regardless of whether you have played the game or not. If you have a Square Enix account with multiple service accounts, none of them may have an active subscription. If your service account has been resolved or suspended for violating the Terms of Service, you will not be able to join the free login action. If you purchase a subscription during Free Play Time, your free play time will be forfeited. You will not be able to log in to any other platform for which you do not have a registered license during Free Playtime. If you have multi-platform licenses registered on a service account, free play time will start on all platforms at the same time. Well, who lures this offer into the world of Eorzea? If you need gils while playing in FFXIV, you can buy gils on ffxiv4gil. You can get 2% discount with code if you buy Final Fantasy XIV Gil on FFXIV4GIL.